thank you for this post, been trying to tell americans this. do you know how many are still fighting for health care charges related to agent orange, DU, and other nerve agents, is criminal. Sadly I am still fighting with the VA and it has been 20 years now. Assholes, every one of them….. This is really sick on the heals of the debate about universal health care! I think that we should stop all wars and bring our troops home. We can go back to war when we can figure out how to humanely treat these wounded warriors when they come back to us … which would mean no more war! Thank you for sharing it with us Bill. We should be outraged and disgusted!!!!!! Thank you so much for reblogging this. Hopefully more people can spread this type of information so that when it comes time to vote they/we can hold our representatives accountable. They are happy to make disabled Veterans but seem not willing to help them afterwards. Exactly right! I sent this to friends, put it on facebook, etc. It breaks my heart that we treat our warriors so poorly. We give millions of dollars and adoration to everyone from Michael Jackson to Howard Stern… but our women and men who risk their lives in the military, first responders, etc we use them as long as they are useful to us and then throw them away without batting an eye! That is disgusting and unjust. 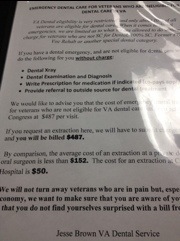 My boyfriend has trouble like this at the VA. No tooth coverage unless you’re 100% disabled. Ugh. Sadly, history informs us that veterans have generally been abandoned by their governments once their use by date has passed. Sure they sentimentalize about them on Commemorative Occasions when they want to whip up a bit of patriotism, but try asking for a set of teeth. Reminds of when I worked as a clerk for my country’s veterans Affairs Dept many years ago. The Dept had a niggardly attitude to dispensing dentures. But I just approved everybody whenever I could. Eventually the dept heads found out what I was doing and there was an unpleasant scene, but at least a few old “diggers” got to eat their steak. This injustice is without excuse or explanation.